Katie grew up in Kirkland, Washington. She grew up participating in gymnastics, basketball, tennis, and cheerleading and wanted to combine her interest in sports and her previous experience working with children with disabilities in to a career where she could help people. 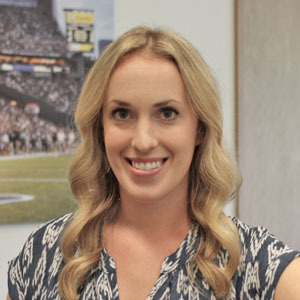 She graduated from Washington State University in 2011 with her Bachelors of Science in Kinesiology. She then spent a year gaining experience at variety of different physical therapy locations including outpatient orthopedics, pediatrics, and neurological setting before attending physical therapy school at the University of St. Augustine for Health Sciences in San Diego, CA. Katie Graduated with her Doctorate in Physical Therapy in August of 2015. During Katie’s education she had the opportunity to work in a variety of physical therapy settings. She spent time working at a long term acute care hospital in Ruston, LA, an outpatient pediatrics clinic in Canton, OH and an outpatient orthopedic clinic in Woodinville, WA. Katie enjoys working in the outpatient orthopedic setting and working with a wide range of pathologies where she can help each patient meet their specific goals through manual therapy, corrective exercise, and patient education. Katie spends her free time hanging out with friends and family, hiking, working out, traveling, and playing with her two kittens, Harley and Shay.